ROH was in Dallas, Texas on Thursday night as the Road to G1 Supercard tour began. This was the first of three straight nights of Road to G1 Supercard shows in Texas. The three events feature a 12-team Tag Wars tournament, with the winners getting a Tag Team title shot at ROH's 17th Anniversary pay-per-view and a spot in the Crockett Cup tournament. Sterilized jazzy lounge music blared as the baby oil-soaked Titus flexed and posed in the ring at the beginning of the show. The crowd’s initial “R-O-H” chant overlapped with these moments. Marty Scurll came out to a superstar’s response. He was wearing new leopard print tights with “Villain Enterprises” on the back, a different aesthetic from what he wore during his Elite run. Scurll did his superkick on the apron spot and a superplex later on. Titus did a big tope con giro in response, and at this point all of the baby oil on his chest dried up. He used a pop-up Liger Bomb but missed a not-so-good looking frog splash, which led to Scurll catching Titus in Graduation for the win in this opening match. This was fine. It felt like a good house show match in that it was solid in ring action, though it was nothing spectacular -- and it didn’t have to be. It was purely fan service, and the fans sounded satisfied as they chanted “MAR-TY” over and over as Scurll exited. They showed a package of Juice Robinson introducing a new stable in ROH, LifeBlood, which consists of Robinson, David Finlay, Tenille Dashwood, Tracy Williams, Mark Haskins, and Bandido. Robinson declared it’d be a new era for ROH and that they are hitting the figurative reset button on the company. Dashwood came out with Robinson and Finlay, then joined the announce team to help call this match. Juice was over with the crowd and they chanted his name before the match started. He and Coughlin kicked the bout off. Coughlin is huge. He’s built like a football player, which makes sense as Ian Riccaboni explained he was a former rugby player. Finlay and Robinson both used sentons during the first part of this match. Robinson was the only one with charisma in this match and the crowd only really reacted to him throughout. Fredericks used a nice dropkick and spinebuster on Finlay. The Young Lions did a double Boston crab spot and it got a loud reaction. Both showed lots of intensity during their high spots. Finlay used Trash Panda on Coughlin to win the match. This wasn’t all terrible but it’s also not worth watching if you don’t have the time. The interesting takeaways here were Robinson’s popularity with the crowd and how well the US Young Lions did. They looked green, sure, but they didn’t look that much better or worse than Finlay, or even Robinson with regard to in-ring work. Katsuyori Shibata came out to second for Connors, his other NJPW LA dojo trainee. Connors is another supremely athletic Young Lion and was not booked like a total rookie in this match -- or at least he didn’t really come off as one. He was presented as a rookie to look out for throughout, like he’s possibly the Next Big Thing. He wasn’t completely jobbed out in this match, though the bout itself was under ten minutes. Connors was able to slam Cobb and put him in a Young Lion Crab, but Cobb quickly hit a spinning back suplex and Tour of the Islands for the win. The two shook hands afterwards. Beer City Bruiser came out to do commentary with Riccaboni and Colt Cabana. This was another decent but forgettable match. Castle was very popular with the crowd. He and Jay Briscoe kicked the match off. They jawjacked for a bit until Jay Briscoe grabbed the mic and asked Castle when he’d let The Boys grow up and fight like a man, so one of the Boys tagged in. Both Boys got some high flying offense in at the front end of this match. The Briscoes are great at feeding moves to anyone and making them look good. Aside from a huge pop-up Pounce from Shane Taylor, Jay Briscoe took the lead through most of this match, or any other time it involved a Boy. Dalton Castle looked great in this match but was only tagged in for short spot-laden spurts. Considering Castle’s nagging back issues (he is still wearing a back brace), he’d probably be more valuable in a tag team scenario for 2019. Castle almost got the pin after a Bang-a-Rang, but Shane Taylor dragged the referee out of the ring, breaking up the pin and ultimately getting his team disqualified. Taylor and the Briscoes accosted the ref some more and pounded on everyone else until David Finlay and Juice Robinson made the save. Robinson got on the mic after this and told the heels and the crowd that they were going to deliver honor tonight in the main event (Gresham/Lethal vs. Williams/Haskins). He used the term “honor” a lot and implied that there was to be no more funny business for the rest of the night. While they seem to still have a long way to go, the Twisted Sisterz, Holidead and Thunder Rosa, inject something resembling depth to the Women of Honor division. They look so much different than the other Women of Honor and that somehow creates an illusion of depth in the division, something it desperately needs for 2019. Holidead heel’d it up for most of this match, especially at the beginning, growling at the crowd and refusing to break submissions. “She likes it!” was the explanation she used to the ref on not breaking a hold. Madison Rayne has the fired-up babyface deal down pat, and midway through this match she showcased some fast-paced offense. Holidead is slow in the ring and Rayne is quick, so the visual dynamic shined through as the two went back and forth. Holidead got a close two count after a ripcord cutter. Rayne attempted a crucifix into a sunset flip pin but botched it. They still went with this finish as Rayne picked up the pin here. Thunder Rosa immediately jumped Rayne after the match. Sumie Sakai then came out and chased the Sisterz off with a chair in a mildly awkward angle setting up a possible tag match this week between Sakai and Rayne vs the Twisted Sisterz. This would have been a great match if it had been cut down by five to seven minutes. At the start, Taven got on the mic and made fun of a guy wearing a fleece vest before the match. He then mentioned that while both he and Rocky have held titles in NJPW and CMLL, the thought of the comparison makes him sick. Taven called Rocky a Melvin and put himself and his purple title over for a while longer until Romero jumped Taven and the match got underway. Taven’s heel aura is so much more obvious compared to other heels on the current ROH roster. He constantly built heat while Romero’s pops got louder as the match went on. Taven used a Disaster Kick to knock Romero off the apron. He then demanded the “idiots” in the crowd clap for him. They brawled outside. Romero later dove off the stage onto Taven. A bunch of balloons floated up from under the ring and Romero thought it was from Vinny Marseglia, Taven’s Kingdom stablemate who often does the balloon spot, but it was a trick that allowed Taven to beat on Romero some more. This slowed toward the middle. Taven did a top rope Boston Crab that looked very cool and got a loud reaction. Romero later did a tornado DDT and the crowd decided they’d get very, very behind Rocky at this point. That or they decided they just really hated Taven. The two got into a slap fight that Taven got the better of. Taven later reversed Sliced Bread into a backbreaker. They went through a sequence of hot high spots and then the crowd started chanting “fight forever.” Like clockwork, Taven hit the Climax and the match came to an end. Again, if this were five or so minutes shorter it’d have been great. It got the loudest reactions of the night so far, too. The Kingdom came out right after this for their Tag Wars match. Taven and Scurll teased getting into it with each other until Scurll chased Taven to the back. The crowd was loudly chanting for PCO before this one. There was a point at the beginning of this match where PCO demanded Brody King chop him a few times before King whipped him into the opposite corner, where he basement dropkicked O’Ryan in the face. Marseglia tried chopping King later on and totally whiffed; King’s reaction was priceless. The crowd wouldn’t really react to the Kingdom’s heel work and just wanted to cheer Villain Enterprises. This happens often at ROH shows, it seems like, where the crowd sits politely, silently, until they’re cued back into the match. It makes for a strange crowd dynamic. Marseglia was obviously put off by the silent crowd and called them silent “puppets,” desperate for some kind of reaction. They eventually bit and chanted more for PCO. PCO used a number of power moves I’ve never seen him use before. He took tons of punishment in this match, both intentional and unintentional, including one scary moment when the Kingdom and PCO miscommunicated on either a back body drop or flapjack. PCO landed on his neck but seemed like he was fine afterwards. The Kingdom did House of a Thousand Corpses but Brody King broke up the pin. Marseglia later missed a diving senton atomico through a table, which got a massive reaction from the crowd. King used a Gonzo Bomb on O’Ryan, then PCO hit his monstrous moonsault for the win. This was a decent brawl that felt centered on the star of the match, PCO, who has adapted quickly to the modern in-ring pace we see in ROH. On paper, this could have been a disaster. It wasn’t. This was originally supposed to be Flip Gordon vs. Bandido, but since Gordon was injured at Honor Reigns Supreme, Young wrestled in his place. Bandido was very over in Dallas. He didn’t struggle much working with Young, whose style is entirely different. Bandido showed more charisma than I’ve seen out of him before, especially compared to a few weeks ago in Concord, NC. Young received his usual amount of heat tonight. He blended his style to Bandido’s, as opposed to vice-versa, and it felt like it mostly worked. The crowd stayed mostly silent as Young worked over Bandido for the majority of this match. You could hear every taunt and every complaint to the ref from Young, which made the production feel unintentionally provincial. The crowd eventually became restless and started jeering Young, and when Bandido made his comeback the crowd apparently did, too, as many of them came to their feet to see Bandido tornillo and Orihara moonsault around the ring. After Young superplexed Bandido, he rolled through and went for another, but Bandido countered with a deadlift vertical suplex. The crowd did a “This is awesome” chant after seeing that one. The two cranked it up a few more notches for the final sequence that ended with Bandido using a rolling slingshot German suplex with a bridge for the win. After the match, Young went to shake Bandido’s hand but kicked him in his left knee. Bandido sold this like crazy and was carried to the back by ROH staff. Riccaboni spoke in a hushed voice on commentary, with the intent obviously to turn Bandido into one of the company’s top underdog babyfaces. It seems to be working as the crowd chanted for Bandido as they cut away. A short video package for Rush was shown after this. Kenny King joined Riccaboni and Cabana on commentary for this match. All wrestlers shook hands before the bell. Typically straight-laced shoot style wrestler Tracy Williams came out to dance music. I’m still not sure why he’s called “Hot Sauce,” either. Williams’ left shoulder is still in a functional sling. He began the match against Gresham and both exchanged fresh-looking chain wrestling and escapes. Both tagged out to their respective teammates. Before Haskins and Lethal started wrestling, both posed and postured and it sounded like the crowd was very much behind Lethal. Williams and Haskins showed a natural chemistry together. Both used a variety of joint locks and low-spots to wear down Lethal throughout the beginning of the match. This seems to be the pattern in a lot of Lethal’s matches these days: He tends to let his opponents shine over him, Lethal always seeming to function as the underdog champion, always fighting from underneath. Gresham eventually blind-tagged himself into the match and used a deadlift German suplex on Williams; Lethal followed up with a tope suicida. 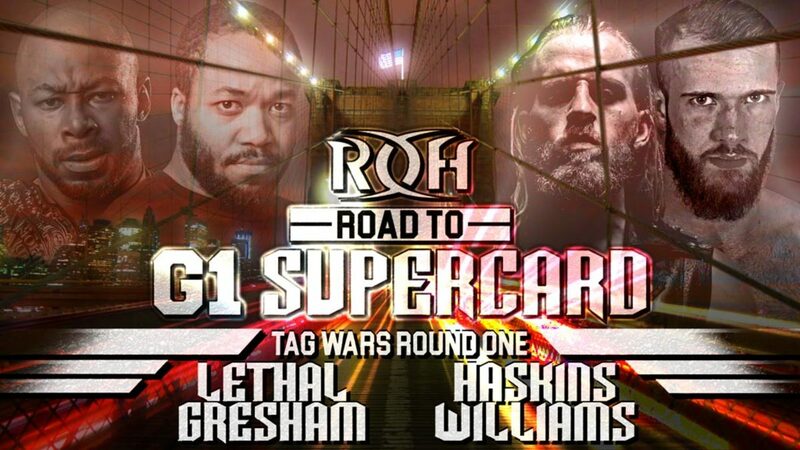 Gresham and Lethal then worked over Williams’ leg for a long while, all in true Anderson family fashion, always cutting the ring in half, always cognizant of Haskins reaching out for the tag. Gresham used a number of creative submission moves on Williams during this section of the match. Williams was able to counter eventually with a cradle brainbuster on Gresham. Haskins came into the ring with enough fire to illicit a few reactions from the crowd. He used a sit-out Death Valley Driver for a close two. The match’s story became more clear when Williams was back in the ring, as he did a noticeably good job of selling his left leg, the one worked over by Lethal and Gresham. He was later whipped into the ropes by Gresham and collapsed on his way there, clutching his knee. Lethal tagged in and locked a figure four onto Williams for a close call that was broken up when Haskins shoved Gresham into Lethal. Haskins used some impressive offense on Lethal after this, which included a rather long-distance diving double stomp for two. The crowd chanted “this is awesome” during the final sequences. There were great high spots and near falls, and Williams and Haskins showed an authentic fire that eventually got them over with the crowd in that there were a handful of times where they and myself felt for a second that they really could have gotten a fluke pinfall tonight. That was quickly kiboshed when Lethal and Gresham did a double team slingshot cutter maneuver for the win. This was a very smart match with a good finish. All four wrestlers went to shake hands until the heel tag teams of Shane Taylor & Silas Young and the Briscoes came out and beat the babyfaces down. Juice Robinson then came out to help and got beat up for it. Riccaboni then mentioned to find out what happens on Friday night in Houston as the broadcast faded out.